I love the heartwarming stories that come from the imagination of Abby Clements. From Meet Me Under the Mistletoe and Amelia Grey's Fireside Dream, right down to Vivien's Heavenly Ice Cream Shop and its tasty Mediterranean sequel, The Heavenly Italian Ice Cream Shop. Each time when a new novel from this author is announced I feel a little flutter of excitement and receiving the title in the post is an utter joy. 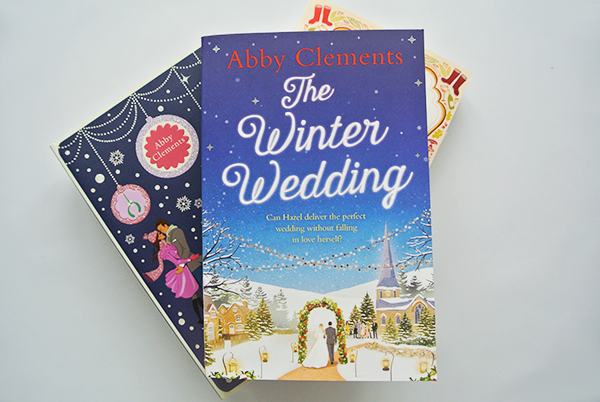 While I would love to return to the world of Amelia Grey one day, I admire how Abby Clements manages to always create a brand new cast of interesting characters and stories that still feel familiar and I quickly fall in love with, and with her latest endeavor, The Winter Wedding, she has done it again. Hazel works as a designer and while she loves creating things with her hands, she has been promised a promotion at work for a long time now and she has finally come to realise it's just not happening. Instead she's working crazy hours doing all the odd jobs, which her boss takes credit for, yet not even making enough money to pay her expensive London rent after her sister has moved out to live with her fiance. Something needs to change, and quickly. So Hazel places an ad for a roommate and when people hear what a great job she is doing planning her sister's wedding, the exciting opportunity arises to move on from being under-appreciated at work and instead take a risk on her own business, one where she does get the credit for her hard work and praise from her clients. Of course starting a brand-new business from scratch and without any professional wedding background isn't easy, but Hazel is hard-working and passionate, two skills that prove to be key for the new direction in her life. The Winter Wedding and Hazel's journey throughout will resonate with many 20 and 30-somethings living in London or another big city; working long hours for a company which doesn't appreciate them and still not being able to make rent for their tiny flat. Welcome to the 21st century. It certainly felt familiar to me, and Abby Clements depicted this very realistically without glorifying the ongoing struggle of finding a healthy work-life balance. So often in women's fiction books (although I have noticed a shift in the past few years) the main character works in their dream job already, or even when working as an assistant somewhere they can still afford to buy tons of amazing clothes and live in a nice place in the centre of London. Needless to say, having the opportunity to identify with Hazel's far more realistic work life was a very welcome change. And, reading about how she took a leap of faith and worked hard towards her dream career has spurted me into action to do the same. I know she's a fictional character, but that doesn't make her any less inspirational! While her work and the inability to pay her bills consume Hazel's life at times, it doesn't consume the pages of the book as we also get a glimpse inside her relationships with her twin sister Lila, brother Ben, friend Sam and even clients such as Gemma, Eliot, Josh and Sarah. And of course there is a romance, or two, thrown in as well. I loved it, even though I saw a new love blossoming long before those in question did. That didn't matter, however, as the joy in reading about relationships isn't always in the who, but rather in the how and the journey they follow to get there. I hugely enjoy returning to a favourite author as you know that you will be rewarded with a great read. Even though the characters and setting might be an entirely new one, there is always the sense of familiarity at the edges of the book as the author's voice tells the story – and I love Abby Clements'. Filled with real characters facing the same ups and downs in life as you and me, the story is one of hopeful inspiration, mixed with a healthy dose of heartwarming charm. Many thanks to the publisher for a copy of the novel in exchange for an honest review. This review first appeared on Novelicious. The Winter Wedding is published by Simon & Schuster and you can buy a copy of the novel from Foyles or your own preferred retailer.